Today I'm going to go over how to pronounce the letters of the alphabet. You may find if you speak with an accent that native speakers will ask you to spell something if they feel they're not sure they've understood what you said. For example if you have a foreign name that is unfamiliar to Americans, you might find them asking you to spell it after you tell them what your name is. A. A is simply the 'ay' as in 'say' diphthong . A. So you can see teh jaw goes from being more dropped, A, to closing more, A, as the tongue reaches up towards the roof of the mouth for the second part of the diphthong. A. The next letters all have the 'ee' as in 'she' vowel sound  where the corners of the mouth pull a little bit wide, ee, and the tongue raises very high, ee, in the front/mid part of the mouth. B. B had the B consonant sound where the lips start together, bb B. And opens into the 'ee' as in 'she' vowel sound. C. C begins with the S consonant sound, ss, and moves into the 'ee' as in 'she' sound. C. D. D begins with the D sound, dd, dd, the voiced consonant, and moves into the 'ee' as in 'she' vowel sound. D. E is simply the 'ee' as in 'she' vowel sound. E.
F. F begins with the 'eh' as in 'bed' vowel sound , which has quite a drop in the jaw, eh, eh, F. It then finishes with the F consonant sound where the bottom lip moves up and touches the top teeth, ff, and you release air through that. It is unvoiced. F. G. G again has the 'ee' as in 'she' vowel sound. It begins with the 'jj' as in 'jar' consonant sound . G. H. H begins with the 'ay' as in 'say' diphthong, just like the letter A, but it ends with the 'ch' as in 'char' consonant sound . H. Ch, ch where you release just air though the mouth position. H. I. I is pronounced with the 'ay' as in 'buy' diphthong . I. J. J begins with the 'jj' as in 'jar' consonant sound, jj, it then has the 'ay' as in 'say' diphthong. J, J. K begins with the kk K consonant sound and then has the 'ay' as in 'say' diphthong. K.
The next three consonants all start with the 'eh' as in 'bed' vowel sound. L, L begins with the eh sound and moves into the L sound, where the tip of the tongue, L, L, moves up to touch the roof of the mouth just behind the teeth. L. M. M begins with the eh sound and then finishes with the M consonant sound where the lips come together - M, mm, mm - while you make noise with the vocal cords. M. N. N begins with the eh sound and moves into the N consonant sound. N, nn, where the tongue raises to the roof of the mouth and the lips remain open. N, N. The letter O is simply pronounced with the 'oh' as in 'no' diphthong . O, O.
P. P begins with the P consonant sound, pp, where the lips are together and you release air. It then goes into the 'ee' as in 'she' vowel sound. 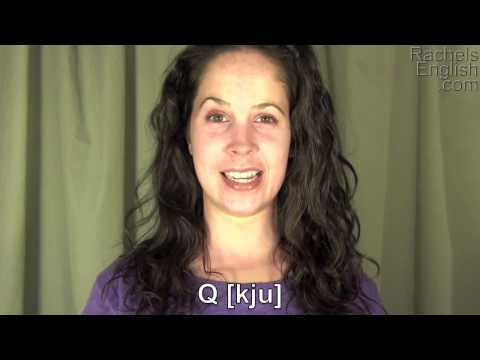 P. P. Q. Q begins with the unvoiced kk K consonant sound, and then has the 'ew' as in 'few' diphthong . Q. R. R begins with the 'ah' as in 'father' sound  and then moves immediately into the R consonant sound . R, R. S. S begins with the 'eh' as in 'bed' vowel sound. Eh, Eh, S S. It then moves into the S consonant sound. S. T. T begins with the unvoiced tt T consonant sound and then has the 'ee' as in 'she' vowel sound. T T.
U. The letter U is pronounced with the 'ew' as in 'few' diphthong. V. V begins with the voiced vv consonant sound where the bottom lip moves up to the top teeth. V, v, followed by the 'ee' as in 'she' vowel sound. V. W. W begins with the D consonant sound. dd. It then moves into the 'uh' as in 'butter'  followed by the B consonant sound. Double. It then has the schwa  and the dark L sound. Double, W. And the 'ew' as in 'few' diphhtong. W. The accent is on the first syllable. W. X. X begins with the 'eh' vowel sound, it then has the K and the S consonant sounds together. Eh kk ss. X. Y. Y begins with the W consonant sound, where the lips are in a tight circle. It then opens into the 'ay' as in 'buy' diphthong. Y. Z. Z begins with the voiced consonant, zz, followed by the 'ee' as in 'she' vowel sound. Z. And now, all of the letters of the alphabet. Listen and repeat. If you can record this, that would be helpful. You can then listen to it and compare your pronunciation with mine to see if there are any errors.